Offerings v.s.Sacrifices, What is the Difference? When I first started on my path, I read a lot of books on Wicca and Paganism. One custom that many write about is the giving of an offering to the G&G as a way of saying ‘thank you for everything’ or as a way of asking for help with something. But one thing that I noticed is that in one book, the writer would say ‘offering’ while another author would use the word ‘sacrifice’. Now I don’t know about anyone else, but when someone uses the terms ‘pagan’ and ‘sacrifice’ in the same sentence, some might get the wrong idea…like boiling bunnies or chaining a virgin to a stone slab. There is a difference between an offering and a sacrifice. The lines between them can be confusing at times but there is a difference. A sacrifice is what the word means: the person is giving something up that is vital to THAT person. I mean the person that is making the sacrifice. You sacrificing your big sister’s mp3 player to the G&G by throwing it into the river and asking for a good grade in math is not a sacrifice because you didn’t give up anything. The most popular example of sacrifice is a sacrifice of blood. YOUR BLOOD! Not the blood of some poor helpless living creature. Blood is considered a sacrifice because you are giving a part of yourself up, a part of your essence. It is the reason why many ancient civilizations used human and animal sacrifices, because a living beings life essence it a very powerful form of magical energy. An offering is the giving of something that you have in abundance. 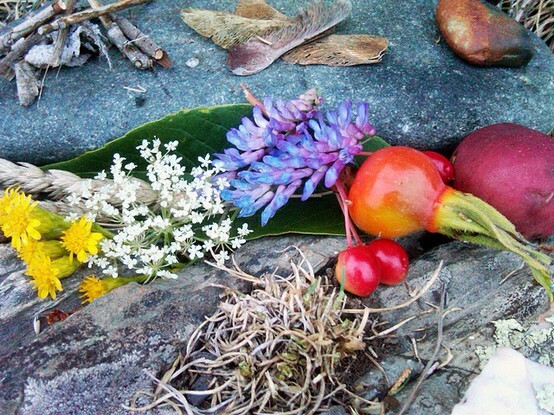 Many pagans have alters that they store their offerings on like freshly cut flowers, flower petals, salt, bits of bread or fruit, etc. Food is one of those confusing things that many question is it an offering or a sacrifice? Food is more accessible today than it was a thousand years ago, where the giving of food was a much bigger deal. When I do offerings, I like to use things from around the house that I know no one else will use. Such as the ends of a loaf of bread, cornmeal, fallen rose petals from our garden outside, leftover candy from holidays, etc.